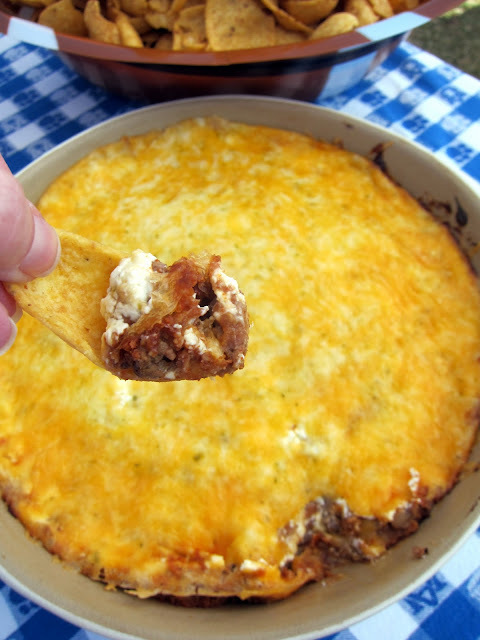 Taco Dip - refried beans, taco seasoning, ground beef, sour cream and cheddar cheese - everyone goes crazy over this dip!! SO easy and SO delicious! This is one of our all-time favorite tailgating dips. I've been making a version of this dip for years. It is easy to make and it is always a hit. I changed it up this time and added some ground beef. I think the ground beef really put this dip over the top. This dip can be assembled ahead of time and stored in the refrigerator until you are ready to bake it. We served the dip with Fritos, but tortilla chips would be good too. In a skillet, brown the ground beef over medium heat, drain. Mix beans, cooked ground beef and taco seasoning. Spread bean mixture in the bottom of a 9x13-inch baking dish. Spread the sour cream on top of the beans and then top with cheese. Bake at 350 for 25-30 minutes - until cheese is bubbly. Serve with Fritos. I make a similiar dip that is easy. 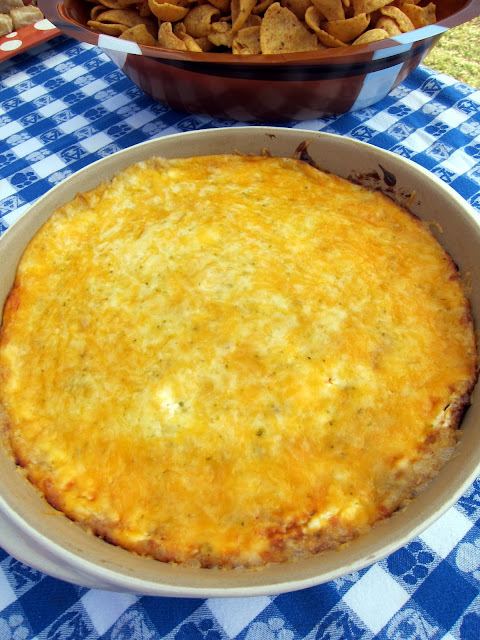 Our version of this dip is a can of prepared chili, cream cheese, shredded cheese and green onions. Serve with Tortilla Chips. 1 8 oz cream cheese, 2 packages of Parmesan (the small packages), one medium red onion chopped finely. Mix all together, heat in 350 oven until cheese mixture is bubbly. Serve with flavored crackers, or Ritz. As usual I'm salivating. I'm going to need a drool bib before opening your posts from now on. I like the ground beef addition or chorizo would rock too! I used to put salsa and shredded lettuce in between the cheese and the sour cream layer, but it gets too soggy, I think. My cuzzin only has Fritos. It make he walk kinda funny. If you put a jar of salsa on top of the sour cream, it adds a great taste! I always add a can of green chilies mixed in with the beans. I made this last night for the Cowboys football season opener and it was GREAT!!! Husband loved it AND there's leftovers!! W00t!! I subbed ground turkey for beef, non-fat greek yogurt for sour cream, and cut the cheese from 2 cups to about 1 1/4 of reduced fat cheese. Plus, added a 4 oz can of diced green chilis to the meat mixture and used my own taco seasoning instead of a store bought packet. AMAZING!!!!!!!!! I wonder how it would taste with black beans vs. refried beans? Sounds amazing either way! That sounds delicious! Can't wait to try it. Thanks for sharing. Pamela Taber, do you mix it all together and bake or layer that? I've done similar type of dip, but always top with chopped onion, lettuce, and tomato. I think whatever one does is terrific. You can also leave out the meat, do more beans, and not bake so cheese is also loose. Makes a yummy dip also!